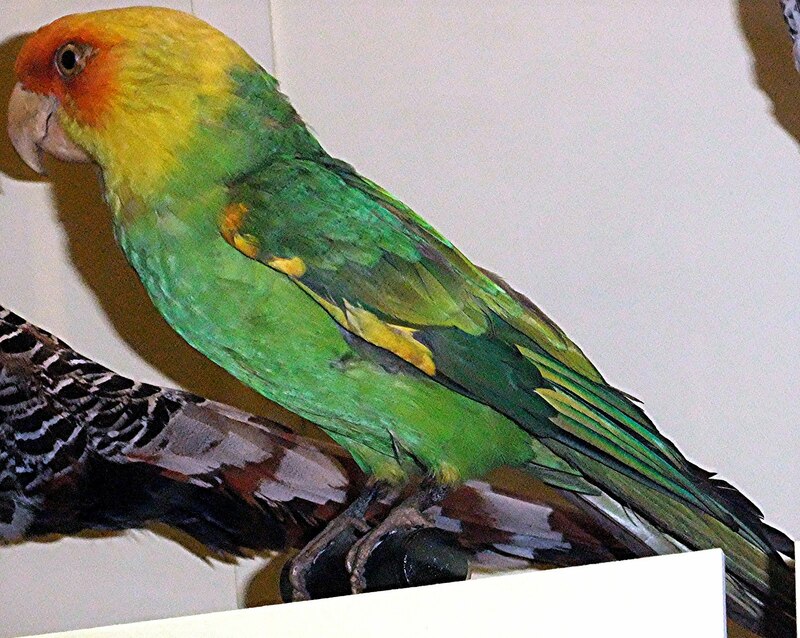 The Carolina parakeet Conuropsis carolinensis, a readily recognizable species with bright green body in the nominate eastern subspecies C. c. carolinensis (bluish-green in the Louisiana subspecies C. c. ludovicianus) and striking yellow head was the only parrot species native to the eastern USA, and was also the only member of the parrot genus Conuropsis. Once very common in North America east of the Great Plains (especially in swampland areas), it acquired notoriety among fruit farmers as a considerable pest, because large flocks would descend upon orchards and devour great quantities of the farmers’ valuable produce. This, together with its popularity among woodsmen as a shooting target, and as a pet (responsible for the trapping of great numbers), resulted in its rapid extermination. 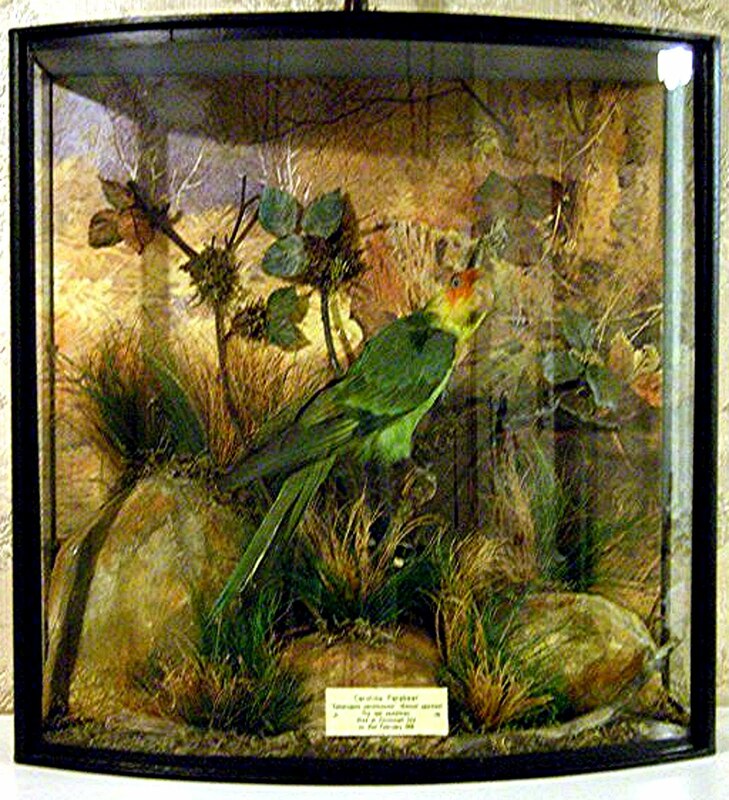 The last wild specimen of either subspecies known to have been collected was taken on 18 April 1901 in Florida, the Louisiana subspecies had died out by the early 1910s, and by February 1918 only a single captive specimen remained of the eastern subspecies – and, therefore, of the entire Carolina parakeet species. 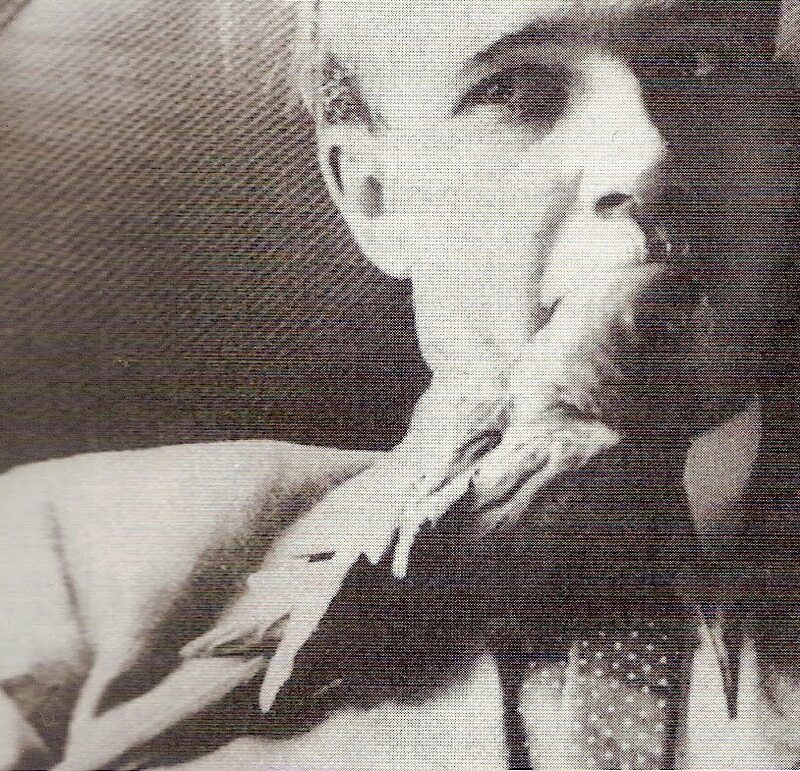 By an ironic coincidence, this last living individual, a male called ‘Incas’, was housed at Cincinnati Zoo — which had already been home to the last confirmed specimen of the passenger pigeon Ectopistes migratorius just four years earlier — where he died later that month. Thus, in less than four years, this same zoo had played host, reluctantly but impotently, to the extinction of two of North America’s most iconic species of bird. 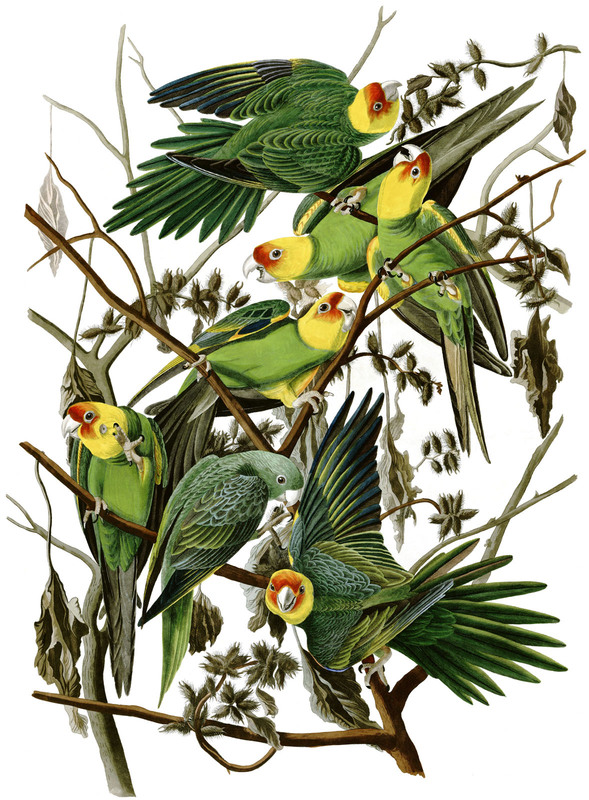 Yet as with the passenger pigeon, reports of Carolina parakeets continued to surface for many years after their species’ official extinction date. Some of these may well have been based upon sightings of non-native green parakeets that had escaped from captivity, but other, more compelling accounts are also on record. For example, in Extinct and Vanishing Birds of the World (2nd edn, 1967) James C. Greenway noted that in 1920 a flock of about 30 individuals was reported near Florida’s Fort Drum Creek by Henry Redding, a local man. Equally remarkable (but in this case for all the wrong reasons) was a sighting made in 1926 by Charles E. Doe — at that time no less a personage than the Curator of Birds at Florida University. The presence in Okeechobee County, Florida, of three pairs of parakeets closely resembling the supposedly extinct Carolina parakeet evidently filled Doe with great excitement. So much so that, according to Errol Fuller (Extinct Birds, 1987), he proceeded to rob the poor birds of their eggs! 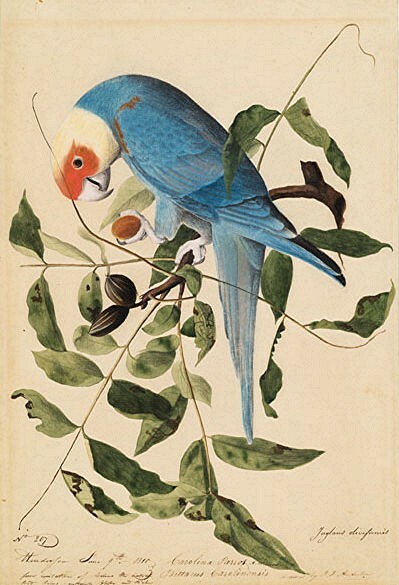 From carrying out extensive enquiries, esteemed American ornithologist Alexander Sprunt Jr became convinced that before the start of the Second World War in 1939, Carolina parakeets still survived within the Santee swamp area of South Carolina. 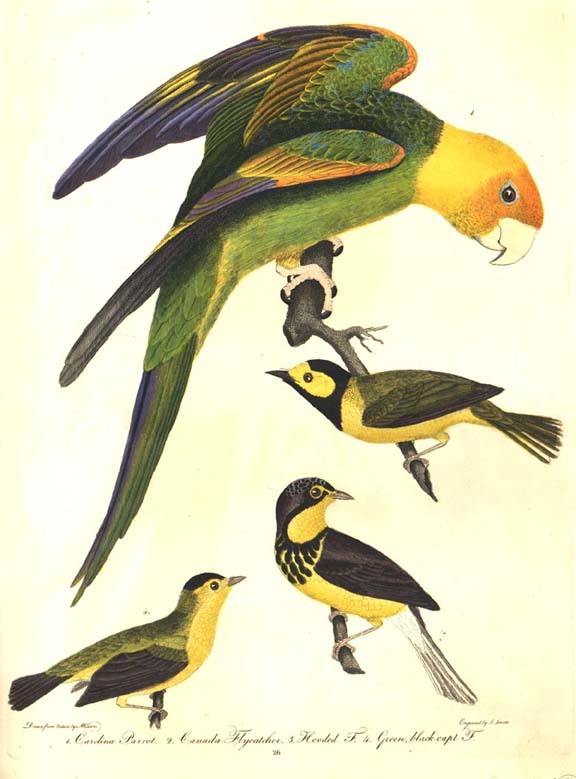 One account that particularly impressed him had been obtained from a local woodsman named Shokes, who alleged that during the three to four years in which he and his son had been employed in that area as National Audubon Society bird wardens in the 1930s, they had seen green-bodied, yellow-headed parakeets there on three or four separate occasions. During one of these, Shokes had observed two such birds, evidently adults, followed by a smaller, younger individual with wavering flight, as they made their way across Wadmacaun Creek to Wadmacaun Island. Sprunt himself, conversely, never saw adult specimens but one day sometime between 1936 and 1938, whilst in the company of John Baker (then President of the National Audubon Society) and acclaimed ornithologist/bird painter Roger Tory Peterson, he had seen a bright green bird fly swiftly past about 50 yards away, with a rapid, dove-like flight which convinced him that it was an immature Carolina parakeet. Sprunt sent news of his investigations to his English friend M.S. Curtler (Animals, 23 November 1965). Sadly, even if the Santee Swamp birds were genuine Carolina parakeets, they could not have saved the species from extinction, because the swamp was eventually destroyed by developmental processes for a power plant. Nonetheless, there are many other swamps still existing within this bird’s original range that remain aloof and little-explored even today. In 1937, for instance, Oren Stemville shot a colour film of a bird in Georgia’s famous Okefenokee Swamp that resembled a Carolina parakeet. So although unlikely, it is not impossible that some Carolina parakeets still linger undetected in such localities, with any occasional sightings of them being discounted as nothing more exciting than non-native escapee species. This ShukerNature post is adapted from an excerpt in my book Extraordinary Animals Revisited (CFZ Press: Bideford, 2007).